It’s unlikely that Pop Corkhill is discussed as an outfielder on par with Mays, Mantle, and Musial. Perhaps he should be. For his time, Corkhill was a defensive template. Worthy of Cooperstown? As of the writing of this article in 2019, Corkhill’s name is not commonly argued for Hall consideration; his career batting average was .254. But the evolution of scholarship regarding the deadball era yields more attention on Corkhill’s fielding artistry, ability, and achievements. Corkhill played in 88 games in 1883 — he ended the season with a .216 batting average and 81 hits, including 10 doubles and eight triples. His playing time increased in 1884, as did his offensive output: .274 batting average and 124 hits, including 13 doubles and 11 triples. By 1885, it was clear that Corkhill’s presence on the Cincinnati squad was a given. He led the American Association with 112 games played and found even more playing time in 1886 with 129 games played, plus a .265 batting average, and 97 RBI. Corkhill matched his RBI total in 1887. During his time in Cincinnati, Corkhill also contributed to the pitching staff; he took the mound 17 times and compiled a 3-4 record with one game saved. In 1885, he led the major leagues with seven finished games. Corkhill wrapped up his major-league career with Pittsburgh in 1892, playing in 68 games and dropping below the .200 average for the first time in his career — .184. In mid-September, 1892, he announced that he would leave baseball for good.29 His .254 career batting average encompassed 1,120 hits. In this last season, Corkhill showed flashes of brilliance, proving wrong those doubters who believed that he had lost his effectiveness later in his career. During a 6-4 loss in April to the Louisville Colonels, Corkhill made “a most remarkable running catch.”30 Approximately 1,500 fans braved a drizzling May afternoon to see Corkhill prevent the opposition from gaining an offensive foothold: “His game was of the highly sensational kind, cutting off at least three three-baggers.”31 It wasn’t enough — Cleveland won 6-1. Corkhill knocked in Pittsburgh’s lonely run. Mistaken identity has rarely been funnier. 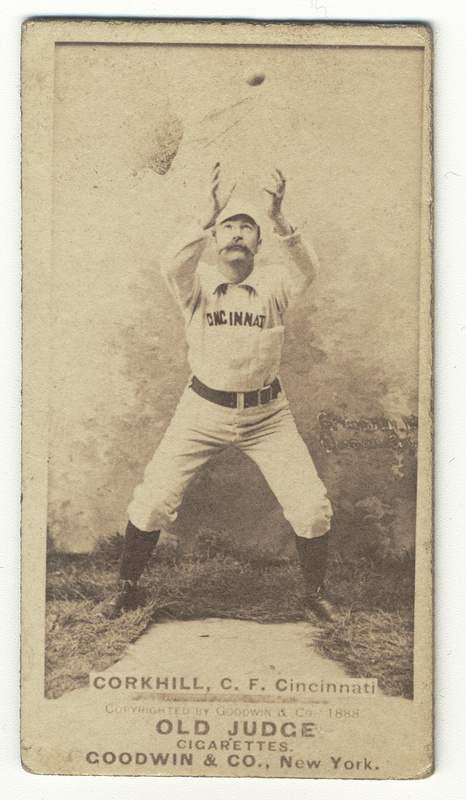 An Old Judge Cigarettes baseball card shows Corkhill in his Cincinnati uniform, looking towards a falling ball with his arms outstretched preparing to catch it. The image captures the essence of one of the best — if not one of the best known — outfielders to play the game. This biography was reviewed by Darrell Jarvis and verified for accuracy by the BioProject fact-checking team. 3 Ren Mulford, Jr., “The Era Of Experiment In Good Old Cincinnati,” Sporting Life, February 2, 1907. 4 Ren Mulford, Jr., “Fighting Reds,” Sporting Life, July 13, 1907. 5 “A Brief History of Parkesburg,” http://www.parkesburg.org/index.aspx?NID=865. 6 David Nemec, ed. Major League Baseball Profiles: 1871-1900, Volume 1, The Ballplayers Who Built the Game (Lincoln and London: University of Nebraska Press, 2011) 522. 9 “John S. Corkhill,” The Brooklyn Baseball Club: Official Score Book, Season of 1890. “The League Alliance arose as the National League of Professional Base Ball Clubs' response to the perceived threat of the International Association of Professional Base Ball Players in 1877. Having subverted the National Association of Professional Base Ball Players, plucking St. Louis, Hartford, Boston, the Mutuals of New York and the Athletics of Philadelphia from its ranks and adding independent teams from Louisville and Cincinnati, Chicago president William A. Hulbert sought to extend the League's powers to independent teams across the country, limiting the availability of players while protecting the sanctity of contracts.” Brock Helander, “The League Alliance,” SABR Baseball Biography Project, https://sabr.org/bioproj/topic/league-alliance. 10 Nemec, Major League Baesball Profiles: 1871-1900, Volume 1, The Ballplayers Who Built the Game, 522. 11 “Baseball,” Dayton Herald, April 30, 1887: 5. 12 “Bad Fielding: Causes the Reds to Lose a Game, John Corkhill Released to the Brooklyn Club,” Cincinnati Enquirer, September 24, 1888: 2. 13 “A New Player,” Brooklyn Daily Eagle, September 24, 1888: 1. 14 “Latest News Items,” Coshocton Tribune, September 25, 1888: 2. 15 “Still A Chance: For Brooklyn to Capture the Pennant. President Byrne, However, Seems to Have No Hope and is Wasting No Time in Useless Regrets,” Brooklyn Daily Eagle, September 29, 1888: 6. 16 “The Release of Corkhill,” New York Sun, September 25, 1888: 3. 18 “Talking Of Next Season,” Brooklyn Daily Eagle, December 2, 1888: 14. 19 “Costly Errors,” Brooklyn Daily Eagle, August 12, 1889: 2. 20 “One Game For Brooklyn,” New York Times, October 19, 1889: 3. 21 “The Fight Over,” Brooklyn Daily Eagle, October 30, 1889: 1. 22 “Brooklyn’s Pet Players,” New-York Tribune, November 3, 1889: 18. 23 “Keeping It Up,” Brooklyn Daily Eagle, August 5, 1890: 1. 25 “Gloom Across the Bridge Since ‘Pop’ Corkhill’s Release,” New York Evening World, August 6, 1890: 1. 26 “League Notes,” Boston Globe, July 12, 1890: 5. 27 “They Win Another,” Pittsburgh Dispatch, September 30, 1891: 8. 28 “The National Game,” Pittsburgh Press, October 1, 1891: 5. 29 “Sporting Notes,” Akron Beacon Journal, September 13, 1892: 3. 30 “Ehret, The Erratic,” Pittsburgh Dispatch, April 28 1892: 8. 31 “Beaten At Cleveland,” Pittsburgh Daily Post, May 14, 1892: 6. 34 Telephone interview with Jeff Peterman, November 6, 2018. Corkhill’s Top 10 ranking is based on analysis of players as of 2017. 35 “Not Much Interest In The Big Fights,” Philadelphia Inquirer, February 2, 1896: 8. 36 “Sporting Notes,” St. Louis Post-Dispatch, February 10, 1893: 8. 37 “Base Ball Notes,” St. Louis Post-Dispatch, April 13, 1895: 8. 38 1900 United States Census, https://www.ancestry.com. 39 1910 U.S. Census, https://www.ancestry.com. 40 “Corkhill Is Dead,” Philadelphia Inquirer, April 7, 1921: 15. 41 “Mrs. Martha C. Corkhill,” Cincinnati Enquirer, June 9, 1949: 12.